Stumbled upon a new (to me) challenge blog and I immediately like it. This challenge is about using the featured card as a muse to make your own card. I love it because we all have, at one point or another, look at other people's project as muse / inspiration. I used the colourful flowers as an inspiration for my colour stamped images. I also used the image as a general sketch / placement for my card. Hope you like it! I love the way you've interpreted this week's Muse! Thanks so much for playing along! Beautiful card! I love how you incorporated different colors into your stamped image. I'll have to check out this challenge blog, sounds great! Fabulous card! Love the way you inked your image, beautiful. 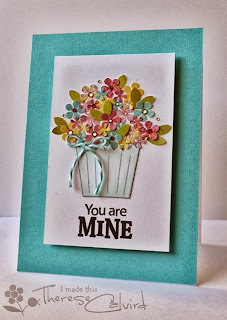 Your card is wonderful, love how you have the multicoloured flowers in the die cut window! Creative and interesting take on the MUSE. I wouldn't have thought of a cut-out as the centerpiece, but it is a great change up for Therese's original!